After 40 years of producing more than 4000 Sikorsky UH-60 BlackHawk and SH-60 SeaHawk helicopters for the United States Army, the United States Navy and many operators in foreign countries a significant development is taking place. The factory new build BlackHawk and SeaHawk helicopters have predominantly been painted with an olive drab green or a dull mat grey livery, but nowadays more and more very colourful Hawks start to appear in the sky. These new colourful Hawks are former military EH-60A, UH-60A or HH-60L helicopters and are now designated FireHawk or UtilityHawk. During August 2018 about 175 units of new and former military Hawk helicopters had been registered with the FAA civil aviation registry. Also several brand new S-70i FireHawks are on order and being completed for delivery next year. In a few years time about 20 units will be active in the State of California alone. Los Angeles County Fire Department. City of San Diego Fire Department. PJ Helicopters – Helibro LLC. Ventura County Fire Protection District. Pacific Gas & Electric Company. Ace Aeronautics LLC – Global Aviation Solutions. The first civilian operator of the FireHawk is the Los Angeles County Fire Department. Two units where ordered in 2000 and have been delivered in 2001 for a total $ 25 million. A third unit was delivered in 2005. In March 2019 another two units are due for delivery. 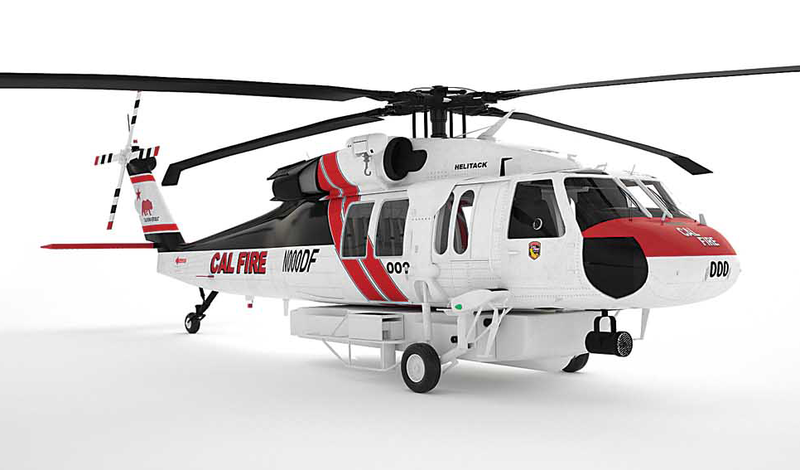 The second FireHawk operator will be the California Department of Forestry and Fire Protection or in short: CALFIRE. They have orderend 12 units of the S-70i model in December 2017. They will be delivered during a 5 year period and will cost $ 20 million per unit. The next FireHawk operator will be the City of San Diego Fire Department. The contract was signed during the HAI Heli-Expo in February 2018. Delivery medio 2019. 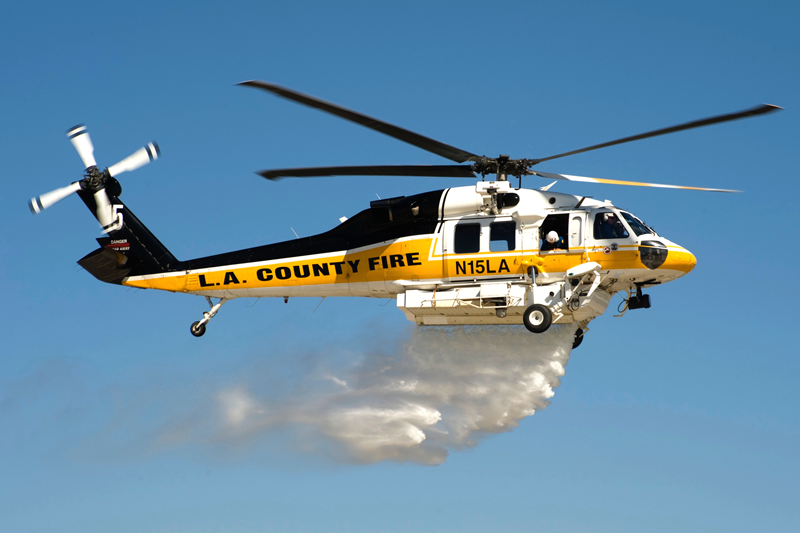 Late July 2018 the Pacific Gas & Electric Company announced it had secured two former U.S. Army UH-60A heavy-lift helicopters as a part of the company’s new Community Wildfire Safety Program. 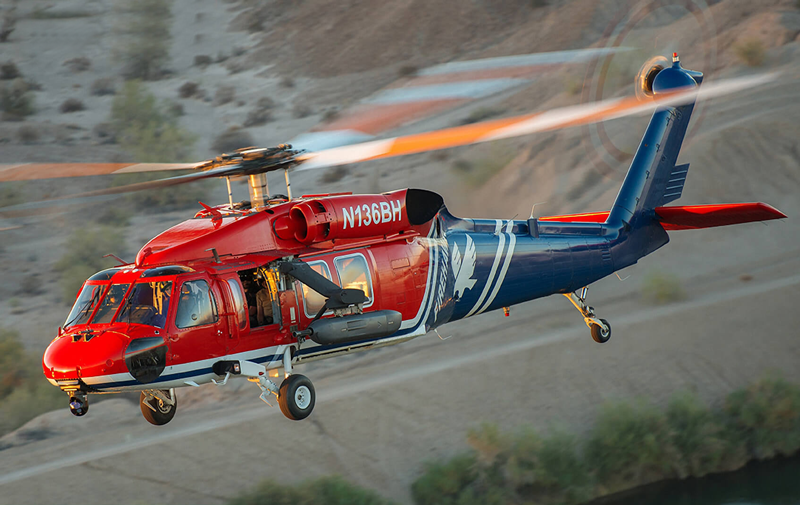 The newly added aircraft were secured through an exclusive use agreement with PJ Helicopters – Helibro LLC. PG&E plans to add two more heavy-lift helicopters in 2019. 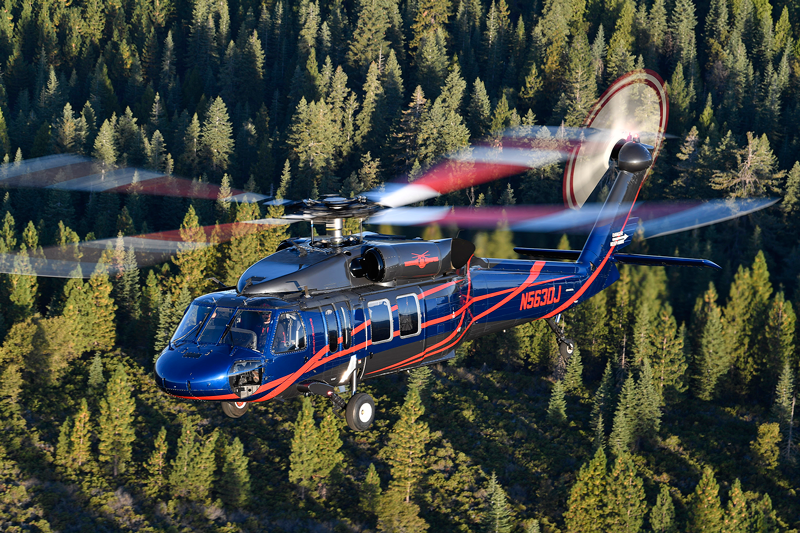 In addition to supporting utility work, PG&E will defer its use to make the new Sikorsky UH-60 fleet available for first responder use, if needed and requested, during wildfires. During August 2018 The Ventura County Fire Department announced the purchase of two former U.S. Army HH-60L helicopters, originally configured as dedicated medevac helicopters. These aircraft had been outfitted with the United Rotorcraft medical equipment and patient litter systems, some of which will be re-purposed in the new FireHawk configuration. 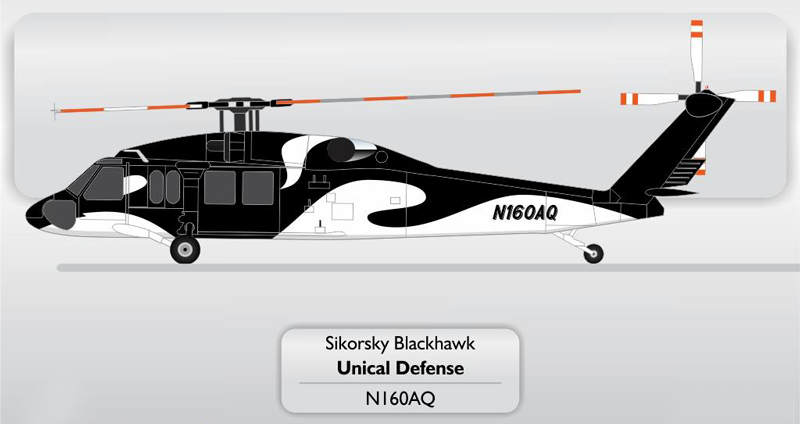 Following a full maintenance inspection by United Rotorcraft, the aircraft will be painted at the United Rotorcraft Decatur, Texas, facility and modified at the company’s Englewood, Colorado, facility. Ace Aeronautics LLC – Global Aviation Solutions, Huntsville, Alabama. This company, founded by Darrell Kindley and Frank Wallace, is specialized in refurbishing and repainting airframes, upgrading analoge avionics to a digital cockpit, and engine and mission equipment upgrades. PJ Helicopters & Helibro LLC, Red Bluff, California. Santa Barbara County Air Operations. 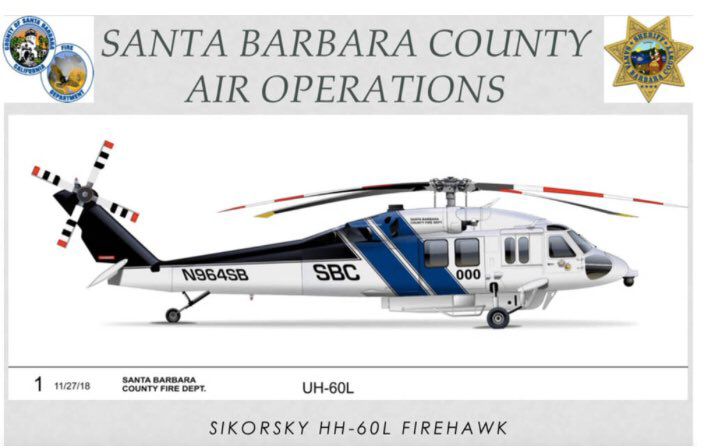 In December 2018 the Santa Barbara County board of supervisors approved the purchase of a used Sikorsky HH-60L Black Hawk helicopter from the National Guard to be converted to FireHawk and used by the Fire Protection District. Unical Aviation Inc. & Unical Defense Inc, City of Industry, California. Timberline Helicopters Inc, Sandpoint, Idaho. Brown Helicopters LLC, Pensacola, Florida. Brainerd Helicopters Inc, Leesburg, Florida. Sikorsky Helitech, Kaan Air Australia and StarFlight Australia have signed an agreement, during July 2018, to bring an initial 10 former US Army UH-60 Black Hawk helicopters into Australia to be refurbished for use locally in aerial firefighting, emergency services and disaster relief operations. 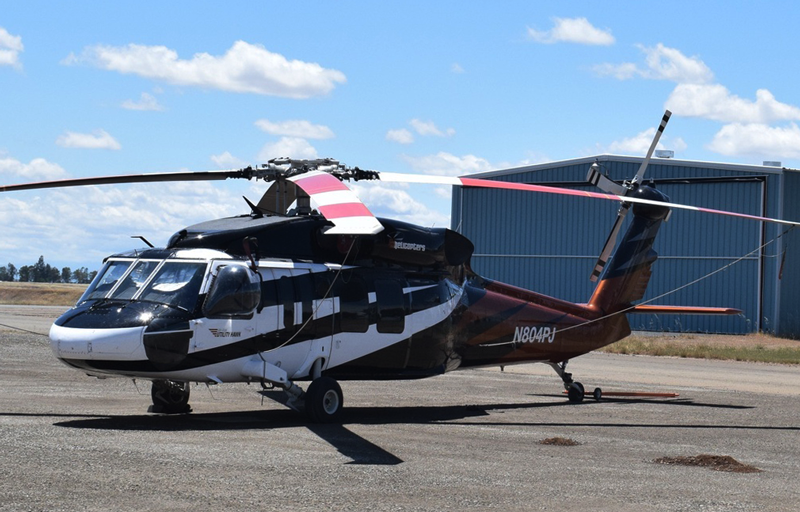 Sikorsky Helitech will carry out the ‘as new’ condition refurbishments at its Pinkenba facility on the banks of the Brisbane River, south of Brisbane Airport, with the helicopters to be imported into Australia from early next year. 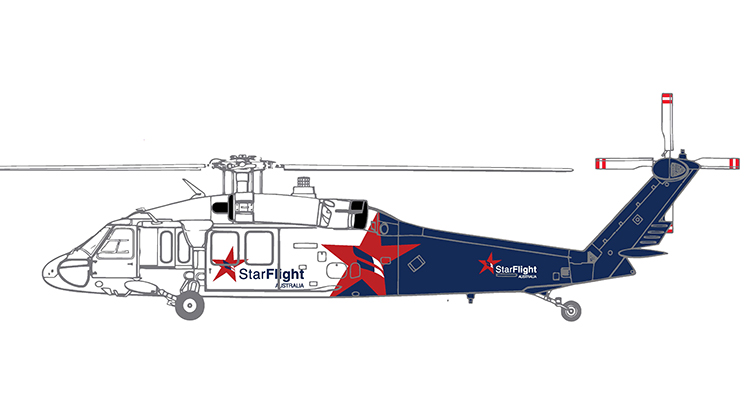 The Black Hawks will be operated by StarFlight Australia, which launched in April 2016, while Sikorsky Helitech will provide ongoing maintenance and repairs. Each Black Hawk will undergo a three-month long extensive refurbishment which will include fitting new, higher-performing General Electric T700-GE-701D turboshaft engines, upgraded gearboxes and new avionics including a helicopter terrain awareness and warning system (HTAWS). The agreement, announced in Brisbane on Thursday, is valued at up to $175 million when including an option to upgrade an additional 10 Black Hawks. The factory new Hawks are correctly identified and registered with their Manufacturer Serial Number in the FAA Registry. Unfortunately the previous military BlackHawks are registered with their former Military Serial Number which is not correct. H145 – EC145T2 – BK.117D-2 production update.